With roots dating back to 1956, Flanzig and Flanzig, LLP is a nationally recognized New York personal injury law firm devoted to the representation of those who have been seriously injured or have lost a loved one as a result of car, truck or motorcycle collisions, pedestrian crashes, bicycle crashes, construction accidents, negligently maintained premises, medical malpractice, as well as other personal injury and wrongful death claims. With offices located throughout the Metropolitan area, our firm represents clients in Manhattan, Brooklyn, Bronx, Queens, Staten Island, Long Island, Westchester and the lower Hudson Valley. Partners Cathy and Daniel Flanzig were both designated as New York Super Lawyers®, a group limited to only the top 5% of trial attorneys in the New York Metropolitan area. The firm has earned and maintains the AV® Preeminent Rating by Martindale-Hubbell®, the highest designation awarded for the firms ethics and ability. Each of the firm's partners were granted lifetime membership in the Million Dollar Advocates Forum and the Multi-Million Dollar Advocates Forum due to the multiple seven figure verdicts and settlements they obtained on behalf of the firm's clients. We have obtained some of the largest settlements in the State of New York for pedestrians and other crash victims. One of our results placed partner Cathy Flanzig on the list of The Top Women Attorneys in the New York Metro Area as published in The New York Times Magazine. The firm has obtained other record setting results by as seen in the annual report of The Top 25 Settlements in the State of New York* for the vicitims of a motorcycle accidents and pedestrian crashes. The firm actively tries cases in the Bronx, Brooklyn, Queens, and Manhattan, Westchester, Staten Island, Nassau, Suffolk, as well as the Eastern and Southern Districts of the United States District Courts. The firm, as well as its cases, settlements, and trials, are frequently covered by The New York Times, The New York Post, Daily News, Long Island's Newsday, News 12 Brooklyn, News 12 Long Island, CBS News, as well as many other national and international news and media outlets. The firm is heavily involved in numerous highly publicized cases throughout New York City and Long Island, which you can read about in further detail here. For more information, call (888) 290-5994. Recovery for a 45 Year Old Student and Pharmacy Clerk who Suffered Neck, Back and Wrist Injuries in an Auto Crash. Flanzig and Flanzig carries on a 60-year tradition of representing seriously injured New Yorkers. The firm’s roots date back to 1956 when our predecessor firm was founded on lower Broadway in Manhattan. Over a half century later, Cathy and Daniel continue this New York legacy of effectively and aggressively representing seriously injured New Yorkers. The firm's reputation as aggressive trial attorneys combined with a wealth of resources, experience, and willingness to try our cases places us in a unique position as being one of the most respected personal injury trial firms in the New York Metropolitan Area. Our own personal experiences help shape our firm. Daniel's experience as an Emergency Medical Technician (EMT) and in the area of Federal Law Enforcement has increased their ability to handle the cases of uniformed officers, Fire Fighters, and other first responders. As an avid cyclist and competitive duathalete, Daniel has created a focused practice in representing cyclists and other vulnerable road users such as runners and pedestrians. Cathy remains in charge of the firm’s appellate practice, no-fault department, and the prosecution of uninsured and under-insured (SUM) motorist claims. She is dedicated to legal issues medically unique to women such as failure to diagnosis breast cancer and other medical malpractice claims. She assists the firm’s clients in a variety of other insurance claims including the negotiation of medical liens, such as Medicare, Medicaid and Workers Compensation. A large percentage of the firm’s practice involves representing the rights and interests of New York Cyclists and other vulnerable road users such as pedestrians. Daniel Flanzig, and avid cyclists and duathalete, serves on the Board of Directors and is a legal advisor of the New York Bicycle Coalition, the State’s leading bicycling advocacy group. He also serves on the Boards legal advisory committee helping to shape pro-cycling and pedestrian legislation in New York. Daniel is the founder and Chair Person of the New York State Trial Lawyers Bicycle Litigation Sub-Committee and a member of American Associations of Justice's Bicycle Litigation Group. He is a founder and Board Member of Long Island Streets, a non-for-profit advocating for safer streets in Nassau, Suffolk, Brooklyn and Queens. 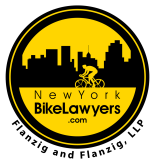 As New York bicycle accident and crash lawyers, Flanzig & Flanzig, LLP has developed New York's first FREE bike crash app. There are plenty of personal injury lawyers in the New York Metropolitan Area. So why should you choose Flanzig & Flanzig, LLP? The firm combines the experience and expertise of larger firms with the personal attention of a boutique practice. Because Flanzig & Flanzig, LLP is 100% focused in the area of personal injury litigation, the firm’s attorneys are highly selective in the cases they handle and prepare every matter as if it is going to trial. As seen in an impressive record of victories, the firm’s long history and dedication pay off. Most insurance companies and defendant’s attorneys know that Flanzig & Flanzig, LLP is prepared to try cases in the courthouses of the Bronx, Brooklyn, Queens, Manhattan, and Nassau and Suffolk counties. This has led to million-dollar verdicts and settlements in the past. Most clients are referred by the firm’s former clients who know they have received the best possible results and attention. Others are referred by lawyers in the area and around the country who trust the reputation the firm has built or and are familiar with the quality work the firm’s lawyers perform. The law firm is staffed by a strong team of paralegals and legal assistants who are knowledgeable about all of their clients’ cases and individual needs. This means clients’ needs are met, all phone calls returned, and everyone knows the status of their case. It is the ultimate goal of the firm to provide aggressive representation as well as a comforting atmosphere as clients go through what is often a difficult and stressful period in their lives.